Vinyl sales earned more than free streaming in 2015 | What Hi-Fi? Sales figures for the US music industry have revealed that the vinyl revival shows no signs of slowing down, while streaming has become the biggest slice of the music industry pie for the first time. 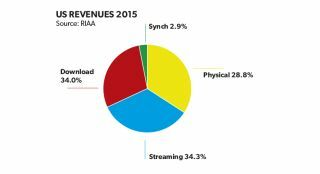 The Recording Industry Association of America (RIAA) has released its annual appraisal of the US music industry and there's good news for lovers of both physical formats and streaming. For the first time, streaming was the largest component of music industry revenues in 2015 (see chart, above), comprising 34.3% of the market and worth well over $1 billion. Paid-for subscription services saw incomes increase by 52.3 percent to a record $1.22bn. This helped the US music industry grow 0.8 percent, to a value of $4.95bn. But it wasn't all about digital, far from it, as vinyl sales continued to grow. In fact, vinyl sales in the US were worth more than the earnings of all the free music streaming services put together (see chart, above), including Spotify Free, YouTube video, SoundCloud and more, something we first spotted back in September. It wasn't just a small amount more either, total vinyl revenues hit $422.3 million, compared to the $385.1 million income from free streaming services. No wonder Sainsbury's has started selling vinyl in the UK. That said, as the chart above shows, vinyl still made up a small slice of the pie compared to CDs. CD sales dropped by around 20 million units year-on-year in 2015, while vinyl sales rose by nearly 4 million - up 32 per cent up on 2014 - but at 123.3 million units compared to 17.4 million, sales of CDs still dwarfed sales of vinyl in the US. That said, with all parts of the streaming music industry growing in 2015, and total streaming revenues exceeding $2 billion for the first time, it looks like premium streaming services will only get more important to the music business as a whole.